This entertaining album showcases chamber pieces by American composers who also wrote film scores for Hollywood. 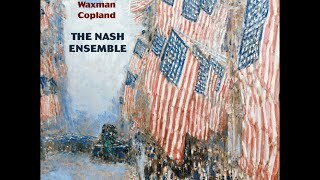 George Gershwin and Aaron Copland are both well known in the concert hall, but we rarely hear works other than film scores from Bernard Herrmann and Franz Waxman. Bernard Herrmann is represented here by a clarinet quintet, titled Souvenirs de Voyage, his last concert piece. It was completed in 1967, by which time he had lived in England for several years, and its themes are rooted in British and Irish culture. At times it's reminiscent of Herrmann's score for Alfred Hitchcock's Rebecca. Franz Waxman's Four Scenes from Childhood were dedicated to the great violinist Jascha Heifetz, written on the occasion of the birth of the violinist’s son Jay in 1948. These are charming mood pieces depicting various events and times of day, and are performed beautifully. Eighteen tracks make up Gershwin's Song-book, arranged by the composer for solo piano, played with verve and style by Ian Brown, demonstrating just what a formidable player George Gershwin himself must have been. A fascinating and enjoyable selection, played with panache and style by top musicians. How did George Gershwin get so rich?